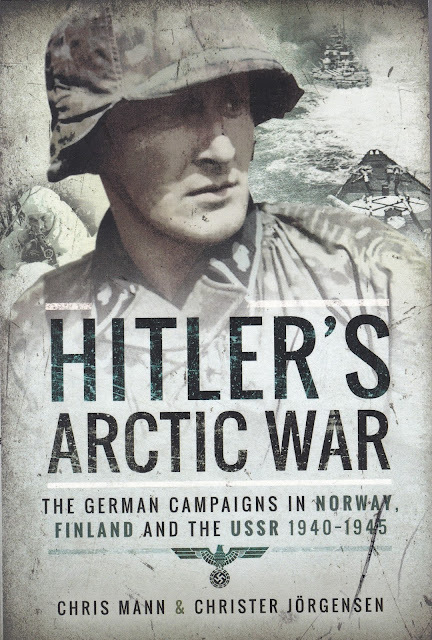 Chris Mann and Christer Jorgensen have put together an interesting, informative and enjoyable narrative about the arctic campaigns of World War II. Pen & Sword provide the publishing 'punch' by using modern publishing techniques that, for example, embed the graphics and images alongside the related text. This is preferred to the usual method of having sets of images in collected sections of the book because these are tied directly with the text. I'm very impressed with the eye-pleasing layout of this book. It can be hard to get a sense of the scope of these campaigns, involving thousands of kilometers of land stretching from Trondheim to Murmansk, from the North Sea to the Arctic Ocean with the Baltic in the middle of it all. The authors do an effective job giving the readers the right impressions about the scope and involvement of land, sea and air forces in this bitter theater of operations. The land campaigns were miserable in the spring and summer, as the troops on each side tried to maneuver using poor maps, having to skirt marshes and ford rushing streams -- all the while dodging swarms of famished mosquitoes. The winters were even worse as men froze to death in the frigid arctic conditions. Many are familiar with the blitzkriegs of Poland and France in the early stages of World War II, but the authors remind us that Scandinavia lived rent-free in the mind of Hitler. Foremost was his concern about securing the resources from this rich area, but he also remembered how the Kreigsmarine got bottled up in World War One without access to non-German ports. He hadn't forgotten that it was the low-morale sailors that fomented the capitulation in 1918. As a result, he eyed the ports sweeping north along the Norwegian coast as vitally necessary to his long-term strategy. But Stalin had struck first in the North, albeit not doing so well in the aptly-named 'Winter War.' The authors explain the origins and outcomes of this brutal side-show in some detail, covering some less-well known facts and intrigues that led up to the conflict. 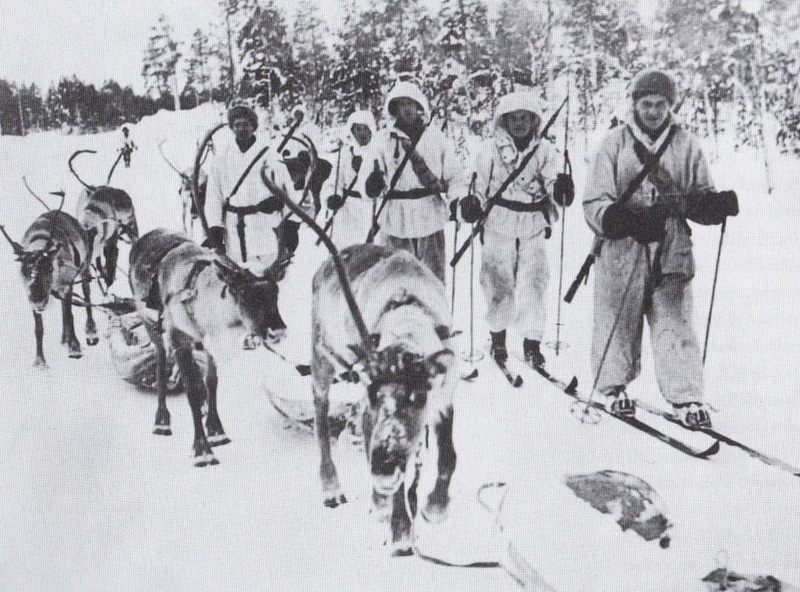 Note that the image above is just a sample of many in the book provided to illustrate the battle for the Finnish frontiers. Ultimately, the Russians won the Winter War, but only by licking their wounds and down-sizing their terms of surrender. Stalin frightfully realized his armies were sub-par. Hitler and his Admirals tried to get the jump on the allies in Norway, doing so even before launching their strikes into France and the Low Countries. This complex operation Weserubung involved amphibious landings and extended naval operations conducted by both sides, stretching along the coast of Norway from Oslo in the south to the far north where lay the vital port of Narvik. So much was at stake that Germany committed precious airborne troops and Western Allies sent vulnerable aircraft carriers directly into the fray. Indeed, the authors do a marvelous job explaining the tos and fros of this short-lived yet strategic battle. 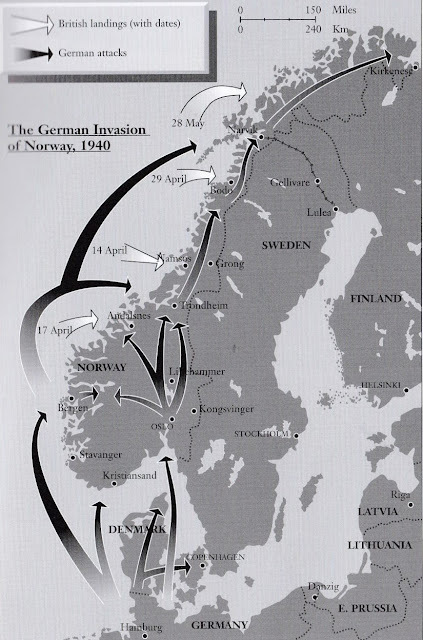 Hitler considered Norway so vital that for the rest of the war he stationed over a quarter million troops to guard the coastline and ports used for the precious Scandinavian resource deliveries. Wargamer aside: it's noteworthy that many strategic wargames about WW2 simply cannot properly model this Norwegian conflict. For example, many game designers avoid the question of using naval forces altogether by stimulating players to make an airborne drop on Oslo as sufficient to represent the entire campaign. Their design focus is on adequately simulating East front combat and Western Allied invasions, but as a result, the Norwegian portion of the campaign is treated as a nearly irrelevant side-show. Part of the charm of studying the actual campaign is in relation to my love of strategic simulation of this war and how elusive it can be for designers to incorporate a realistic Norway campaign. I've yet to see it done satisfactorily in either board game or computer game formats -- at the strategic level. The authors provide due homage to German-Finnish efforts of seizing Murmansk and Leningrad from Russia when the weather was favorable in 1941 and 1942. The weather might have been, but conditions, especially in the far North, were not. 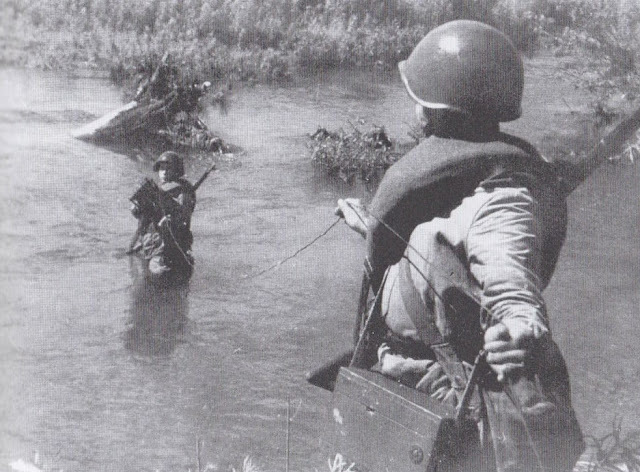 German area commanders and, to a lesser extent, Russian commanders were simply not aware of how difficult it was to attack in these reaches of forest and marsh. 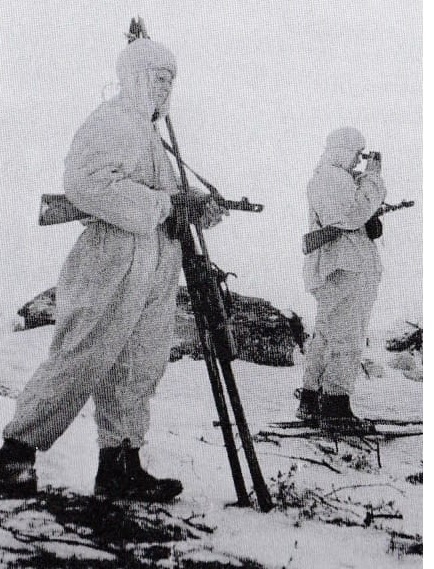 Not only that, but the Finnish were simply not motivated to attack beyond recapturing territory lost in the Winter war, resulting in sporadic diplomatic confrontations with their German ally and resultant campaign failures. Eventually the entire push entered a stalemate period. This episode lasted for three years until the Soviets launched a major counterattack in 1944 designed to drive Finland out of the war. Although stalemate situations are generally not interesting in a military sense, the authors provide absorbing details about operations and discuss the vexations on both sides of the conflict during this period. It's hard to imagine more bitter and horrifying conditions than were found on convoys sending aid to Russia during the grim years of 1942 and 1943. This is when the usefulness of Norway truly manifested as a base of operations for Germany. Even the threat of the Tirpitz leaving it's bases to raid convoys was a horrific consideration for the Western Allies. It wasn't well known that Germany had trouble getting fuel to this ship nor that Hitler was loathe to send it out, due to the losses the Kreigsmarine had suffered taking Norway in the first place. 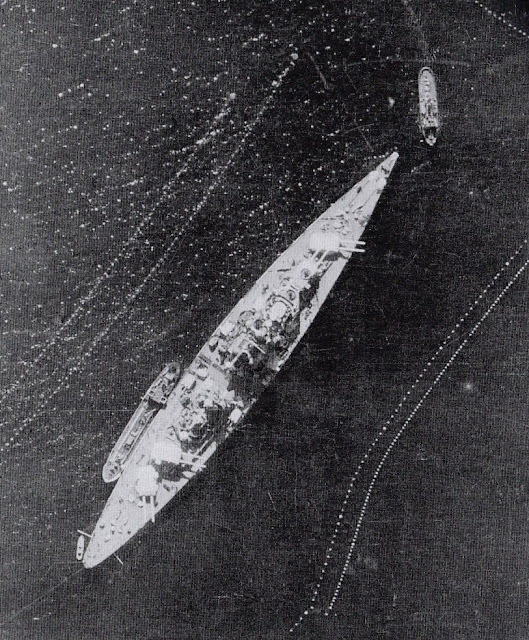 Ultimately the battleship only engaged in one combat mission, bombarding a British naval Base at Spitsbergen. The book describes more so the vagaries of defeats and triumphs on both sides of this far-from-trumpeted and dismal battle theater. Obviously the allies won the conflict in the far north, but it's fair to say that the ultimate winners were once again the Russians. 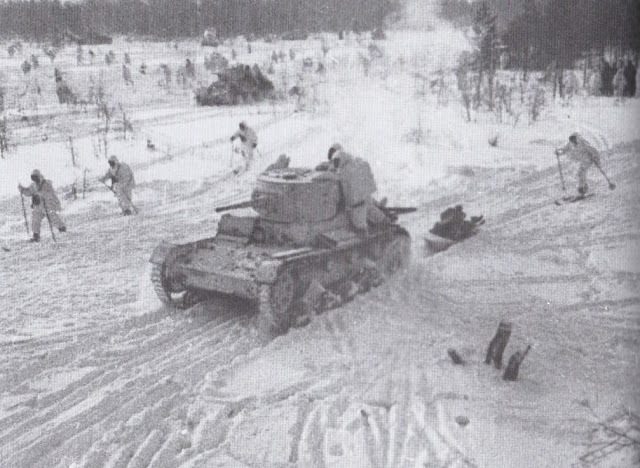 Convoys arrived from the west, supplementing the Soviet war machine, while 1944 attacks in Finland forced the smaller country to change sides and fight Germans and remove them from their soil. The authors definitely do a great job explaining the nuances of the Finnish-German relations during this contentious time near the end of the war. In conclusion, this book is highly recommended. It may not satisfy hard-core historians who want to see orders of battle for each engagement and tables of organization and equipment. The focus in the book is more on an entertaining but accurate account of this vast theater of operations, and this is well accomplished in 224 pages. The book comes with referenced chapter notes/citations, a bibliography and an index. All in all, this reviewer highly recommends adding this book to your collection. -- Marc Hanna.